The 2017 Embry Riddle Asics Classic will feature both a college and high school component beginning at 7:20 a.m.
On the girl's side, Spruce Creek senior Camryn Cooney has the fastest time in the field with her personal best of 18:45 set at the Savanna & David Mohney Memorial Invitational. Fellow senior Isabella Bartczak of Dr. Phillips set a new personal best of 18:53.00 at the Spikes & Spurs Classic and placed four spots ahead of Cooney in that race. Cooney's Hawks and St. Brendan out of Miami are the top two teams in the field. 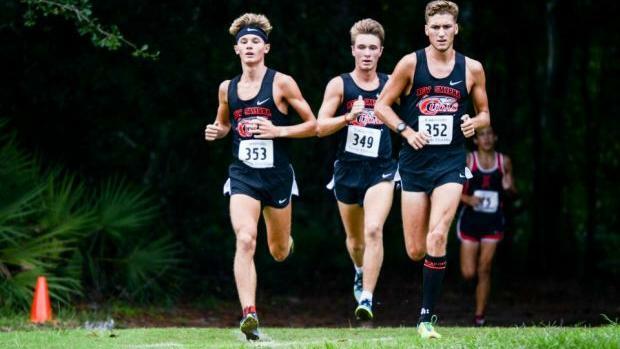 The boy's race features a tough New Smyrna Beach team who won the UNF XC Invitational with a 1-3 punch of Aidan O'Gorman, Payne Meyer, and Logan Horning (pictured above). O'Gorman was second at last year's race. Unfortunately for the Cudas, 3A powerhouse Belen Jesuit is escaping Irma and making the trip to Daytona Beach. The Wolverines are one of the best teams in the state regardless of class lead by senior Joshua Collins. Others to watch include Andrew Miller and Evan Fuller of Fleming Island. Miller's finished no worse than fifth in all three races and has a season best time of 15:47.50 from the Spikes & Spurs Classic. See how our virtual meets have both the girls and boys individual and team races playing. As always, make sure to keep it locked on FLRunners.com for coverage of this meet and cross country action all season long. College Men (8K)	7:20 a.m.
College Women (5K)	7:50 a.m.
High School Boys	8:40 a.m.